As many seniors are resistant to using technology, even those who have smartphones may not know how to use them to their best advantage. If your elderly loved one has a smartphone, downloading a couple useful apps onto his or her phone and showing him or her how to use them may be helpful. 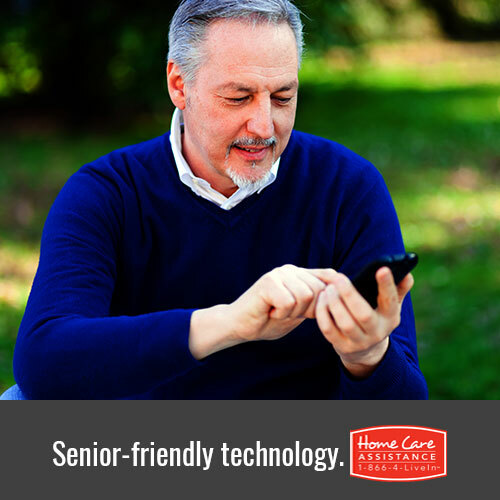 Presented by Home Care Assistance in Harrisburg, here are five smartphone apps that may benefit your elderly loved one. The AARP app can provide your senior loved one with helpful information about money saving strategies and healthy senior living. This app can even connect seniors to volunteer opportunities in their community and notify them of exclusive AARP members-only discounts to help your loved one save money. With a variety of helpful information from the AARP website and magazine presented in a user-friendly format, this app is popular among many seniors. Dosecast is a free medication management application that can help seniors take their medications correctly. The application allows your loved one to create a medication schedule and receive alerts when it is time to take a dose. While a 24-hour or part-time caregiver in Harrisburg can also provide medication reminders, this application has the added benefit of allowing the user to enter customized drug information, including special instructions and expiration dates. The pro version, which costs $27.99 a year, tracks medication compliance, refill schedules, and can sync with multiple devices. This Internet radio app broadcasts programs from the golden age of radio. The station offers live and recorded programming twenty-four hours a day, seven days a week. Consisting of music and shows from the 1920s to the 1950s, the app is a great way for your loved one to reminisce and share memories from his or her younger days. Giving your senior relative 24/7 access to health and first aid information, the WebMD app is a good preventative measure for many health conditions. Through this app, your loved one can learn about different conditions, as well as what causes certain symptoms. The app also offers a database of information about the uses and side effects of thousands of medications. Lumosity is a brain-training program that challenges the user with a series of games developed by neuroscientists. These games are personalized to your elderly loved one’s cognitive abilities and require that your loved one spend about fifteen minutes each day with the app. Each daily “workout” is designed to help your elderly relative keep his or her mind sharp, enhance memory, and improve attention to detail. If you’re concerned about finding ways to keep your loved one cognitively engaged, encouraging him or her to use smartphone apps like Luminosity is a good step. For other strategies that can help promote senior brain health, reach out to Home Care Assistance. Our professional caregivers are expertly trained in modern senior care approaches, including the Cognitive Therapeutics Method, which are designed to foster mental acuity and cognitive engagement. To learn more about our senior care services, including Alzheimer’s, Parkinson’s, and dementia care in Harrisburg, give a Care Manager a call at (717) 540-4663 and schedule a free in-home consultation.